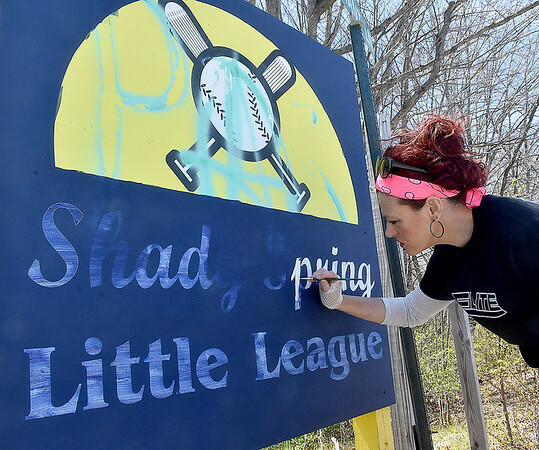 Daniels resident Heather Richmond repaints the lettering on one side of the Shady Spring Little League sign as she works to clean and cover spray paint left by vandals Friday afternoon outside of the baseball complex. Richmond, a nurse at the V.A. Hospital for the last 16 years and owner of The Handmade Home, a side business that specializes in sign and woodwork, decided to help out and get the sign cleaned up for today's opening day ceremonies so the league wouldn't have to buy a new sign altogether. The spraypainted markings left on the sign had been there for some months.